Homemade gifts are special. They have their soul, they history; they are unique, as no crafter can two similar things. They all have their peculiarities. So, let’s take a look at some great homemade gifts ideas and at decoupaged glass bottles and jars in particular. Why these homemade gifts are so good? For one, they are fancy. Decoupaged glass bottles and jars can be very fancy. They can be adorn in any style and pattern you want. They can have flowers, churches, dolls, bears, holiday motives – just anything on them. My decoupaged homemade gifts, i.e. bottles and jars, are covered with acrylic transparent polish. This makes them washable and they do not get scratched or damaged easily. So, you may use them in your kitchen for storing your vegetable oil, tea, coffee, spices or anything else you can think of. They are made for daily wear and tear. These homemade gifts are made out of recycled materials. So, you make another step to living green buying these decoupaged bottles and jars. You may not know it, but storing your vegetable oil in plastic bottles is not safe for your health. There is no perfectly safe plastic. Oil creates a pretty aggressive environment for plastic. Once you open up a plastic oil bottle, you let the air in and make the environment even more aggressive and damaging for plastic. If you keep your oil there for a while, it stats consuming bits of plastic and eventually you consume all that filth. So, it’s a good idea to pour your oil into the glass bottles to keep it safe. 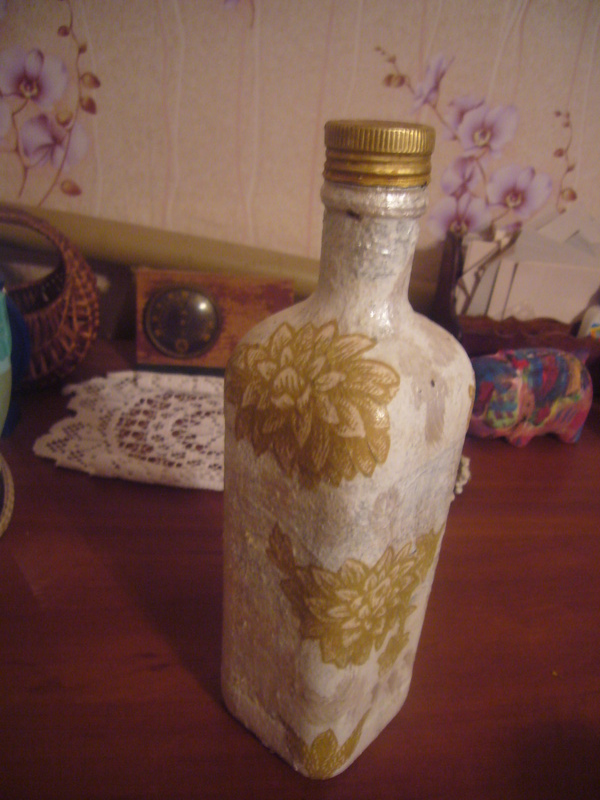 Decoupaged glass bottles are not only safe, but also nice looking. They add up to your home décor. You can order any decoupaged glass jars or bottles from me through my Etsy shop recycledcrafting. 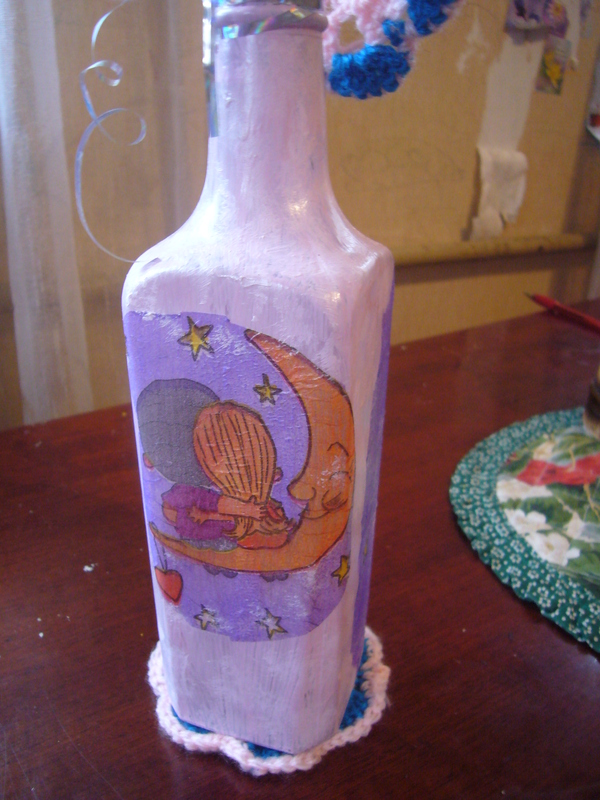 Go to my decoupage project page to see some of my bottle designs. Or, you may order custom designed homemade gifts. 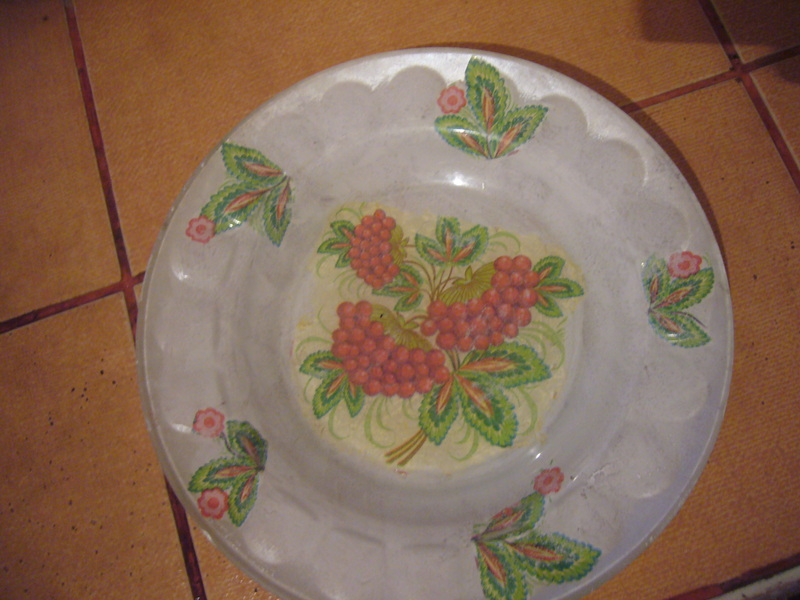 I can use folk Ukrainian motives in decorating bottles, plates or jars for you. This entry was posted in Crafting Tutorials, Decoupage ideas and tagged crafts, decoupage ideas, decoupage projects, decoupaged jars, DIY, etsy finds, etsy shop, find homemade gifts, handmade, handmade gifts, homemade gifts, homemade kitchenware. Bookmark the permalink.